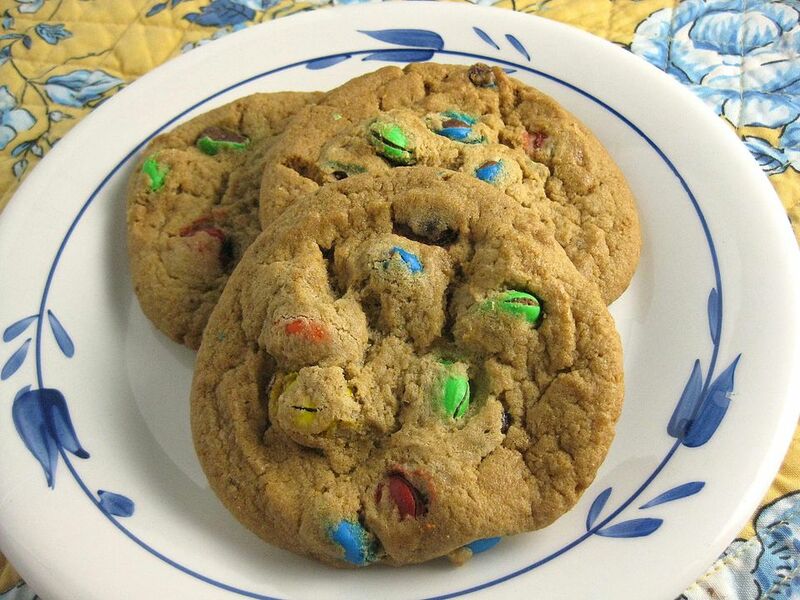 M&M Cookies are my particular favorite type of drop cookie. I love how the crunchy candy shell adds more texture to these soft and chewy cookies. Using part shortening and part butter is the secret to cookies that stay soft longer. And don't worry - you don't taste the shortening! It just adds moisture to the cookies. As with all cookies, the secret to success is measuring accurately. Measuring flour properly is the most critical step. Cookies with too much flour will be hard and dry. Measuring everything else is also crucial. Store these cookies in a plastic baggie at room temperature. If you want to put them into a cookie jar, put the baggie in the jar so they don't dry out. In a large bowl, combine the butter with the shortening and beat until fluffy. Add the brown sugar and granulated sugar and beat until combined. Then beat in eggs, vanilla, and corn syrup. Add the flour, baking soda, and salt and mix with a spoon just until a dough forms; do not over beat. Stir in 1 cup of the M&Ms candies by hand. Drop the cookie dough by tablespoons onto an ungreased cookie sheet. Top each dough ball with a few of the remaining M&M candies so they show when the cookies are baked. Bake the cookies for 12 to 16 minutes or until the cookies are set and very light golden brown. Cool the cookies on the cookie sheets for 2 minutes, then carefully remove with a wide and thin spatula to wire rack to cool completely. Store the cookies in an airtight container at room temperature.